You’ll make your house smell more homely if the fragrance of freshly baked bread is wafting through the rooms (assuming that your viewers don’t have coeliac disease). And a survey of 4000 Australians placed the smell of freshly baked bread at the top of the list. There is also enormous satisfaction to be had in creating something so fundamental to life and that has been baked with similar ingredients for centuries. With that in mind I’ve decided to share the version of the family bread recipe that has made it down the Partridge/Williams wing of the clan. The really great thing about bread is that once you have the basics you can experiment with all sorts of ingredients and create your own distinct variant. And believe me – bread come more basic than this! You’ll need a few things: flour; water; salt; dried yeast; 1 mixing bowl; scales; measuring jug; 3 baking tins; small knob of butter; oven. It’d help if you had a few other things but they are not essential: 3 tea towels; 1 wooden rolling board; oven gloves; 1 cooling wire rack. Before I go on to the how, a little bit on flours. 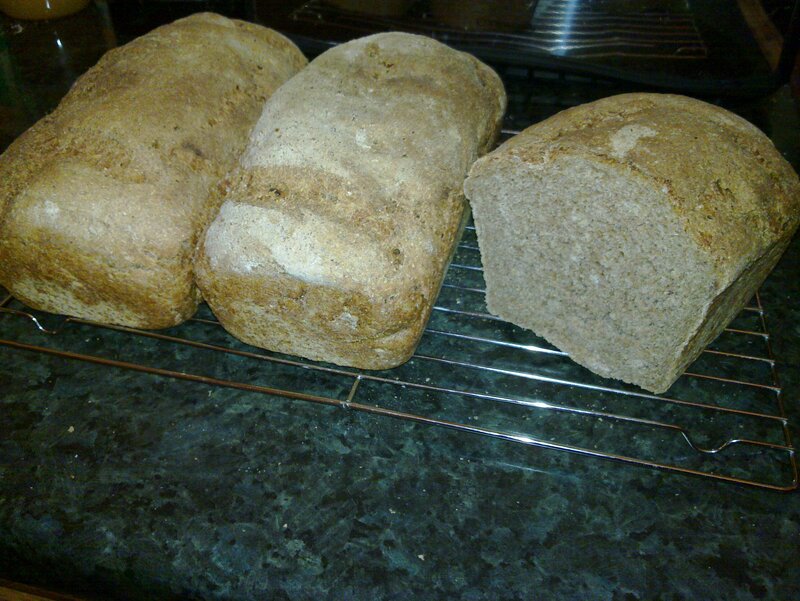 I use a variety of different ones, including strong brown bread flour, strong white bread flour, strong wholemeal bread flour and wholegrain rye flour. There’s nothing fancy or special about them and I usually get the 2kg bags (apart from the rye which seems to come in 1kg bags). I always use a mix, half and half, but you can mix them up as you like. My usual mix is half strong brown and half strong white. Half strong brown and half strong wholemeal is delicious. Being a diabetic in denial, but trying to face up to the fact of it, I did a half rye and half wholemeal mix today. More on that later. If you want a simple starter, go for half strong white and half strong brown. Pour 2 pounds of strong brown flour into the mixing bowl. Add 2 sachets of dried yeast. Add 5 teaspoons of salt. Add 2 pounds of strong white flour. Add 2 pints of lukewarm water (I use lukewarm water to kick-start the yeast). Easy – it is all 2s except the salt. I would keep a little flour and a little water on standby, too, just in case you need to adjust the mix slightly. However, the 2s, if exactly measured, seem to just work and give a dough of great consistency. Mix it all up. It’ll take about 10 minutes to knead your dough. To begin with it’ll feel dead icky and it’ll look like it’ll never come together. Just keep going, mixing it up and scrunching with your fingers. Eventually, it’ll turn into a beautiful dough which will be firm, springy and somehow just feel right. If it’s a little too sticky add a bit of flour and knead in. If it’s a little too dry, splash some water and knead in. Next, cover your bowl with a tea towel and let the bread rise. I prefer a warm room and I like to give it a couple of hours. The dough should pretty much double in size and there’ll be an unmistakable yeasty smell. Before you begin the next step, prepare your bread tins. Smear a third of the knob of butter around each of the bread tins with your fingers. This is so the loaves slip out easily after baking. Flour a wooden rolling board (or a sideboard), take the dough and knock it back down to size on the boad. I like to really smack it around at this point, rolling it, pummelling it and generally working out the frustrations of the week. When you have a nice, fleshy dough, roll it into a sausage and then slice into three equal pieces. Note: this helps contain your nascent Dexter. Take each piece of dough in turn and give it a further good going over. Roll the smaller pieces into three even sausages and plop them into the three baking tins. Cover them with a tea towel and leave them to rise again. It’ll take around 45 minutes, depending on how warm the room is, and you want the dough to be 1.5cm to 2cm above the top of the tins. About half an hour into this second rise, put your oven on gas mark 7 and pre-heat your oven. Once you think they are ready (remember – 1.5 to 2cm above the top of the tin) place your tins side-by-side in your oven. Cook your loaves for 35 mins. When you are finished, take them out of their tins, wrap each loaf in a tea towel and place it on the wire rack to cool. Voilà! House-selling, Aussie-seducing goodness that you can impress your Gran with! Be warned that if you use rye, your rises will be very different. Rye rises more slowly, even in a fifty-fifty mix, and doesn’t rise as far. Today was my first go with rye (I’ve baked with wheat flours for twenty years) and it was a messy business. The dough is stickier and has a more granular consistency than a 100% wheat mix. I let it rise for sixteen hours and it barely doubled in size (it developed a semi-hard crust in that time that got crushed back into the dough on the pummelling for the second rise). I gave the dough around two and a half hours for the second rise and whacked the loaves in the oven at a smidgeon over 1cm above the tins. Cooking time was the same 35 mins. And they are still delicious!